Earning an online doctorate information systems security degree prepares managers and executives for the ever-evolving challenges of protecting data and sensitive information from cybercriminals. A study from the Online Trust Alliance found that the rate of business-related cyberattacks doubled from 2016 to 2017; over 159,000 attacks were reported. Most of these attacks could have been prevented with better information security policies and employee training. Professionals in computer information systems management earn a median salary of $139,220. As companies store more sensitive information in connected databases and cloud servers, the need for executives who understand how to protect that information continues to grow. The U.S. Bureau of Labor and Statistics (BLS) anticipates a 12% growth in employment through 2026. What Else Can I Expect From an Online Doctorate in Information Systems Security Program? We selected the degree programs based on the quality of program and range of courses provided, as well as school awards, rankings and reputation. Located in central Virginia, Liberty University lies just east of the Blue Ridge Mountains. As one of the country’s largest private nonprofit universities, Liberty’s enrollment includes more than 94,000 online students. Liberty offers 349 online programs that include 38 doctoral programs, such as the doctor of business administration (DBA) in information systems. Liberty offers all courses in this 60-credit information security systems degree online, although students may take some intensive courses on campus. Liberty suggests that students complete three years of consecutive coursework. The coursework is followed by a year and a half of dissertation writing, although students may finish the degree sooner. Liberty allows DBA students seeking an online doctorate in information systems security to transfer up to 15 credits. Core courses include topics such as research methods, strategic thinking and human resource management. The DBA specialization in information systems consists of 12 hours of related coursework. Located in the southeastern Kentucky city of Williamsburg, University of the Cumberlands was initially founded in 1888 by a group of Baptist ministers as the Williamsburg Institute. The school became the University of the Cumberlands (UC) in 2005 and currently educates approximately 11,500 students; roughly two-thirds of their students are graduate students. All courses in UC’s 60-credit doctor of philosophy in information technology with a specialization in systems security can be taken online at one’s own pace. 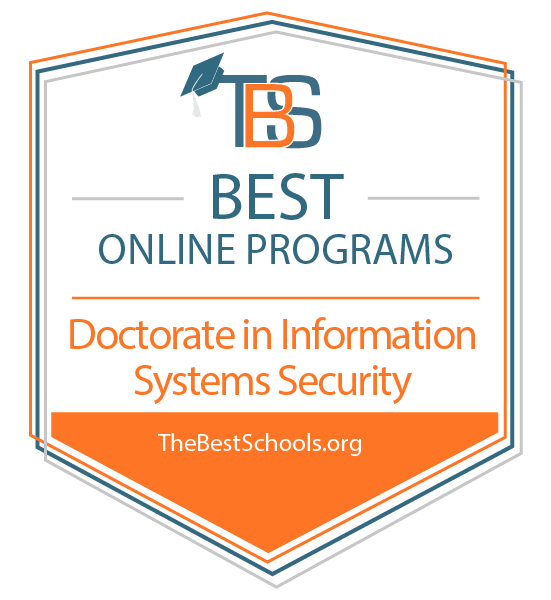 The online doctorate in information systems security includes 18 hours of core courses, 18 hours of professional research &lpar;which includes the dissertation&rpar; and 24 hours of content specialty courses such as cybersecurity. Students learn to use predictive analytics and identify cyberthreats. Students must have completed a master’s degree and earned a GPA of 3.0 or above before applying for an information systems security degree online. University of the Cumberlands is regionally accredited by the Southern Association of Colleges and Schools Commission on Colleges (SACSCOC). The federal government has named UC a National Center of Academic Excellence in Cyber Defense. Dakota State University, a public university established in 1881, offers an online Ph.D. in information systems with an information assurance and computer security specialization. The program provides students with a fully online option to earn the advanced education they need for a variety of information security careers. In the program, students develop the knowledge and skills necessary for successfully managing networks, evaluating and implementing security measures, and protecting valuable data. For admission, students must have at least a bachelor’s degree in a relevant field and have graduated with a 3.0 GPA. Note: The following schools are for‑profit schools. If you have any questions about for-profit schools, check out our guide for understanding for-profit colleges and universities. Colorado Technical University, a for-profit university founded in 1965, offers a wide selection of online degree programs. These degrees include an online doctor of computer science in cybersecurity and information assurance for students who seek advanced careers in the cybersecurity field. Students complete a blend of core courses, research, and dissertation work to develop mastery of the subject. The program includes multiple start dates and may be completed in three years of study. Colorado Technical University is accredited by the Higher Learning Commission (HLC). Colorado Technical University is recognized as a National Center of Academic Excellence in Information Assurance/Cybersecurity. Capella University, an online, for-profit university established in 1993, offers a range of fully-online degrees. These degrees include an online doctor of information technology (DIT) degree and an online doctor in information technology (Ph.D.) degree, both which specialize in information assurance and cybersecurity. Capella University is accredited by the Higher Learning Commission (HLC). Capella University is recognized as a National Center of Academic Excellence in Information Assurance/Cybersecurity. Northcentral University, an online, for-profit university established in 1996, offers an online Ph.D. in technology and innovation management with a cybersecurity specialization. Designed to meet the demands of the growing cybersecurity industry, the program’s students develop the advanced knowledge necessary for a variety of cybersecurity careers. Weekly courses are delivered asynchronously, offer plenty of schedule flexibility and are taught by a 100% doctoral faculty. Northcentral University is accredited by the WASC Senior College and University Commission (WSCUC). An information security systems degree integrates technical skills with policy creation and organizational leadership. Many schools require applicants to complete a graduate entrance exam (such as the GRE) and demonstrate professional experience in computer programming or information systems management. Most schools also require applicants to have a master’s degree; however, some schools do offer integrated master’s and doctoral programs. The Ph.D. curriculum focuses on applied research in data security, which provides practical solutions to real-world problems. Students study advanced computer programming fieldwork, data analytics, and both quantitative and qualitative research methods. Many schools offer concentrations for specific careers, like healthcare information, human-computer interaction design and information assurance. One should expect to spend three to seven years completing upwards of 60 credits &lpar;this varies by program&rpar;. Online programs often offer flexibility for working professionals, though some require on-campus or fieldwork components. The dissertation provides a comprehensive evaluation of what students have learned and their ability to apply independent research to organizational challenges. Students often work with a team of mentors to develop a topic in their area of interest as well as conduct research and data analysis. It can take several terms to complete the dissertation, which is typically capped by an oral defense of a student’s research methodology, conclusions and communication skills. While exact course requirements vary, earning an information systems security degree online builds upon one’s prior training in computer science and programming. Expect to study theoretical principles and demonstrate the practical application of those principles through projects, a dissertation and an oral defense. Students study information security regulations and the impact these regulations have on organizational processes. This course also delves into how organizations govern the use of their data, how they recognize when individuals undermine those policies an ethical issues of trust and privacy. In this course, students learn about encryption protocols and the mathematical foundations of modern cryptography. Students also learn to build secure encryption protocols from cryptographic primitives. Students in this class study the technology that powers internet search engines, which includes text analysis, ranking algorithms and data retrieval. They learn to establish metrics to determine effectiveness, classification and data clustering. In security management courses, students learn to create data security frameworks for organizations. In addition to data security, the course also examines risk mitigation for internal or external security breaches. Students in information assurance courses learn to audit organizational security plans and network architectures. They learn how to identify potential risks and develop mitigation strategies by aligning information security with business goals. Students often create a plan that incorporates policy, security standards and information compliance. An online information security degree prepares graduates for careers developing secure data networks and instituting proper security protocols for organizations like banks, federal agencies and technical consulting firms. Graduates with these advanced technical skills and data analytics knowledge take on leadership roles in any organization by leading technology security efforts. These executives focus on data processing, information networks and long-term information technology purchasing priorities. They often develop organization-wide policies to protect sensitive information from phishing or malware attacks and institute ongoing training to ensure that all staff understand how to prevent security breaches. Network architects determine the hardware and software needs of an organization and provide ongoing support to their company. They analyze data traffic and determine how to best meet both short-term and long-term information technology needs; they often present their findings to top-level executives. They provide training for staff and troubleshoot technical problems. Systems administrators install and maintain hardware and software across internal networks. They implement network security policies and set up monitoring that provides early warnings of data breaches. They help determine future network needs and train employees to use new software.